Dementia is a progressive disease that destroys memory and other important mental functions. More than 3 million cases of dementia are diagnosed each year. Doctors continue to search for why and how to prevent its deteriorating effects. 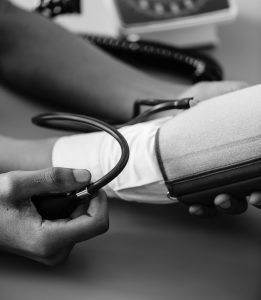 A new study found that dementia might be linked to high blood pressure and researchers have contemplated how these things might relate to each other. Today, we will look at these findings and relay why dementia and blood pressure are connected. The National Institute of Aging describes dementia as the loss of cognitive functioning—thinking, remembering, and reasoning—and behavioral abilities to such an extent that it interferes with a person’s daily life and activities. When our neurons separate our brain loses the ability to communicate with cells, leading to dysfunction. Dementia risk increases for those who smoke, drink heavily, have high blood pressure, diabetes, cholesterol, or old age. The disease has different stages based on impairment and functionality of each patient. Dementia patients can get into better shape and lower potential risk associated with the disease. Dr. Walter Koroshetz, leader of the Mind Your Risk campaign, states his goal is to inform people of the link between high blood pressure and dementia. Blood pressure strains the blood vessels that keep the brain alive. Every time your heart pulses, it pushes blood into your brain; this is why high blood pressure is a link toward brain damage. With high blood pressure, your brain is not able to cycle the blood through your body as easily straining its capabilities. Two large studies have revealed a trend between those with high blood pressure and dementia. “If you had a stroke, even a small stroke, your risk of dementia within the next two years is greatly magnified,” says Koroshetz. “So there’s something about having a stroke that drives a lot of the processes that give rise to dementia.” High blood pressure also links to a person’s risk of developing Alzheimer’s disease, so this theory cannot be too far off. If you believe you are at risk of developing dementia, you should work on lowering your blood pressure. Some methods include losing weight, exercising regularly, eating a healthy diet cutting back on caffeine, and reducing your stress. Be sure to monitor your blood pressure and talk with your doctor frequently. By forming a plan you will be able to combat your high blood pressure and lower the risk of dementia.